Forget everything you know about traditional 3D glasses. The innovative and stylish design of Samsung’s new 3D Active Glasses allows you to comfortably watch your TV for multiple hours at a time. 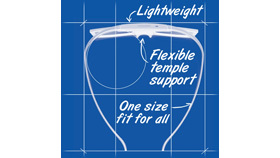 With a flexible temple support and lightweight, one-size-fits-all design, you will forget you are even wearing them. With two 70 hour batteries, you can enjoy up to 140 hours of full HD 3D viewing, which is enough time to watch up to 40 of your favorite movies in a row. Perfect for that movie marathon you’ve been planning. 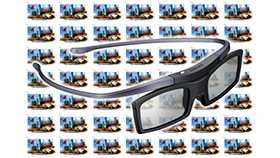 Take the comfort of your Samsung 3D glasses with you to the movies in place of traditional glasses or wear them while on your PC. 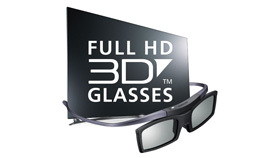 Samsung 3D glasses are compliant with the Full HD 3D Glasses Initiative Standard, which allows you to wear your glasses for more than just your TV. Samsung’s 3D Active Glasses revolutionize the way you watch 3D TV, with a flexible temple support and lightweight, one-size-fits-all design. Our glasses will act like an extension of your own eyes, delivering a seamless 3D experience.